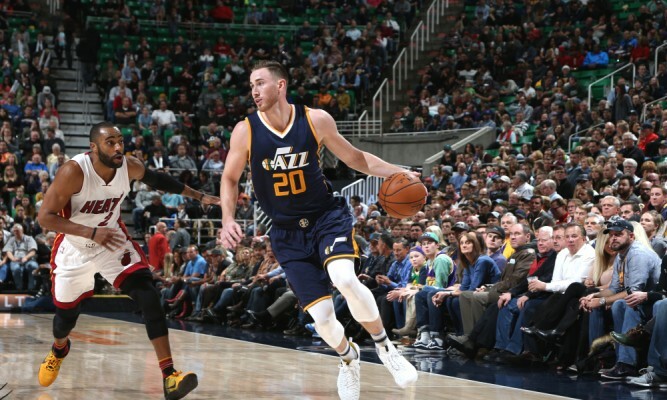 According to NBA staff writer Kevin O’Connor from TheRinger.com, the Miami Heat have emerged as favorites to sign current free agent Gordon Hayward. This comes a day after the wing declined his player option with the Utah Jazz, as widely predicted. Three league sources sense the current favorite for Gordon Hayward is Miami. Reasons: better lifestyle, Spoelstra, "feature scoring role." Head coach Erik Spoelstra, one of the league’s best, would represent a tremendous upgrade over Hayward’s former head coach Quin Snyder. The “feature scoring role” seems to be an attractive feature for Hayward, who averaged 15.8 shot attempts a game last season, which didn’t even rank in the top 20 in the NBA in the 2016-17 season despite his notable efficiency. Uncharacteristically, the Heat are going all out in a very public manner, as they have even hung a banner of Hayward near American Airlines Arena, ahead of their planned meeting with the star. In addition, Miami Herald beat writer Manny Navarro says Miami’s front office is pulling out all the stops.